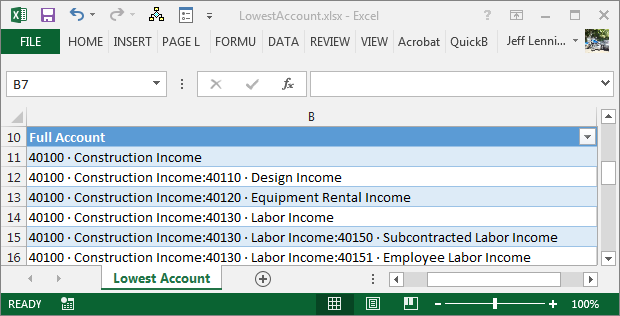 In this post, we’ll explore a formula-based approach that does not use VBA to find the last occurrence of a delimiter and use it to retrieve the lowest sub account from a Quickbooks account list in Excel. When I was doing some research for a project I had a couple of years ago, I was surprised by the many creative ways that Excel users have approached this task. There are several well documented methods, each creative and beautiful. This post walks through the logic of one such solution, and explores each of the functions it uses. If you just want the answer, without all of the narrative, just skip down to the end for the formula and sample workbook. Although this technique can be applied in many situations, the illustration used in this post is that we receive an exported account list from Quickbooks, and we need to split the full account name in order to find the lowest sub account. We need a single column that contains the lowest sub account. For row 11, the formula should return the account. But, for row 12, the formula should return the Design Income account. For row 15, the formula should return the Subcontracted Labor Income account. We need the lowest sub account, regardless of the number of sub accounts in any given row. This is exactly what we will do with a sophisticated formula. But, before we do that, let’s discuss some features that offer alternative approaches. There are at least two features that we could use to help with this task. One feature is text-to-columns (Data > Text to Columns), This works well when there are the same number of sub accounts in each row. If however, some accounts have 2 sub accounts, and some have 3 sub accounts, then the lowest sub account will not appear in the same column. If you happen to be using Excel 2013, the FlashFill feature is easy to use and may be an alternative that would work well. See the FlashFill post for more info. If this task was part of a one-time project, I would probably use FlashFill and be done. It is fast and easy to use. If however, this was a recurring-use workbook, then, I would probably consider using a formula-based approach instead. You see, it is our preference to eliminate all manual steps from a recurring-use workbook. If a workbook will be used in future periods, we prefer to use a formula approach rather than a manual feature approach. That way, when we paste in the updated data, such as the updated account export, the formulas will automatically prepare the data for our use without any additional manual steps. We love storing our data in tables because they auto-expand and auto-fill calculated columns. So even if there are more rows than last period, the formula will be filled down to include any new rows. In order to eliminate a manual step from a recurring-use workbook, I’ll invest a significant amount of time trying to get the formula dialed in. This upfront investment pays handsome efficiency dividends each subsequent period. The approach presented in this post is one such investment. It may take longer initially than using FlashFill, but the benefit is that each subsequent period you can just paste-and-go. There are several great ways to accomplish this task using formulas. I had trouble figuring out who should get credit for the idea used below since this approach is presented in many web pages. But whoever you are, your approach is brilliant…thank you! We want to set up a formula that retrieves the lowest sub account. If there were only one delimiter in a row, such as in row 12 above, then, this task is super easy. However, when there is more than one delimiter, such as in rows 15 and 16, this task becomes more difficult. When you are trying to write a consistent formula that you can fill down throughout a range, and you want it to work on cells with no delimiter (e.g., row 11), cells with one delimiter (e.g., row 12), cells with two delimiters (e.g., row 15), and cells with any number of delimiters, then, the task suddenly becomes challenging. If finding a single delimiter is easy, but finding the last delimiter when there are multiple delimiters is hard, we can simplify our life by replacing the last (right-most) delimiter with a unique character. Now we could ask Excel to find the tag ($) and then retrieve the values to the right of it. This is essentially what our formula will accomplish. Before we write the formula, let’s take a moment to explore the functions it will use. Let’s take them in the order that we’ll need them. As you read through these steps, remember, the ultimate goal is to identify the final delimiter, replace it with a unique tag, and then retrieve the characters that lie to the right of it. If we could somehow count the number of characters in the full account, and then subtract from that the number of characters in a text string that excluded the delimiters, then we would have it. In order to accomplish this we first need the LEN function. The LEN function returns the length of a text string, which basically means it counts the number of characters. Now that we have the total length, we need to subtract from it the length of a text string that has no delimiters. The function we’ll need to accomplish this is the SUBSTITUTE function. This function returns a text string after having replaced selected characters with desired characters. This function will find each occurrence of the delimiter (:), and replace it with an empty text string “”, effectively removing all delimiters. The formula takes the length of A1, which is 35, and subtracts from it the length of a text string without delimiters, or 32, which leaves the number of delimiters, 3. Now that we have the total number of delimiters in the account, we can move to the next step, replacing the last delimiter with a unique character. We need to replace the final delimiter with a unique character that we can later use as a marker, so that we can retrieve the characters to the right of it. Can you think of a function that we can use to substitute one character for another? Yes, the SUBSTITUTE function. However, one little detail. The SUBSTITUTE function as used above replaces all occurrences of the matching character. The SUBSTITUTE function has an optional fourth argument however, that enables us to replace one specific occurrence of the character. The fourth argument, known as instance_num, allows us to replace just the final delimiter with our unique character. So far so good? OK, let’s move to the next step. Now that we have tagged the final delimiter with a unique character, we can simply pull the values that lie to the right of it. This would return the right 8 characters from the string. Since account names have a variable number of characters, we can’t use an integer value for the second argument, 8. We’ll instead need to use functions to compute the number of characters. Fortunately, we have tagged the position with a unique character ($) that we can use to determine the number of characters in the account name. To compute the number of characters that lie to the right of the tag, we compute the total number of characters in the text string and then subtract the position number of the tag. We already know how to compute the total number of characters in a text string using the LEN function, so, let’s figure out how to determine the position number of the tag. This formula returns 27, telling us that the tag $ appears as the 27th character within the text string. If we subtracted the total length, 35, from the tag position, 27, then we are left with the number of characters to the right of the tag, 8. This will return the characters to the right of the tag, which in our case is the account name SegmentD. In the case where a delimiter is not found, the FIND function will return an error. When no delimiter is found in the cell, we want to return the original cell value rather than an error. Thus, we’ll wrap an IFERROR function around the whole thing. The IFERROR function allows us to substitute a value when a function returns an error. This final formula works to retrieve the values to the right of the last occurrence of the delimiter. In a way, it is like performing a right-to-left search. But, since Excel’s FIND function doesn’t support searching from the right, we use the above formula instead. For more detailed information on the functions or their arguments, please consult the Excel help system. Could we pull the account numbers into their own column? Sure, now that we have a column that is the lowest sub account, we could split that into account number and name columns with a variety of different approaches. We could use the LEFT function to retrieve the left 5 characters. This of course assumes all account numbers are 5 characters. If they are variable length, we would need to rely on a delimiter and use the FIND function. Since the LEFT function returns a text string, we could wrap the VALUE function around it to convert it to a numeric value if needed. We could use the RIGHT function along with the LEN function to pull the account names into their own column. The approach presented in this post certainly uses a sophisticated formula. Figuring out and implementing a formula like this makes sense for recurring-use workbooks since you’ll be able to improve your productivity in future periods. If you have an alternative approach that you prefer, please post it in the comments below, I’d love to hear about it! Regarding your “Find the Last Occurrence of a Delimiter to Retrieve the Lowest Sub Account from Quickbooks in Excel” post how would I extract the details from the Left of the delimiter using the code? What if I want to find the string after last of multiple delimiters? Is there any simple and sophisticated way to accomplish it? This post uses data with multiple delimiters, and the technique presented indeed retrieves the string after the last delimiter. The data in the Objective screenshot has row 11 with no delimiter, rows 12 through 14 with a single delimiter, and rows 15 and 16 with multiple delimiters. I hope this is the information you were seeking…thanks! Why we shouldn’t simply use search formula as it reads the string left to right? The FIND and SEARCH functions read the string from left to right, and therefore, returns the position of the first delimiter. When only one delimiter exists, then, you would be fine. However, when there are multiple delimiters, we have a problem because we can’t make the functions search from right to left, and thus, the position of the first delimiter is returned even when multiple delimiters exist. The formula you reference RIGHT(A6,SEARCH(“:”,A6)-1) happens to work on your sample data HE:M:S:A:NT because coincidentally there are the same number of characters (2) after the last delimiter as before the first delimiter. I feel I have to leave a comment as this formula was exactly what I was searching for. I had invested about three hours trying to solve the problem on my own, and I got pretty close, too. But, thanks to Jeff and his fabulous explanation, I now have a working formula returning the correct values. Thank-you, Jeff, you have explained everything beautifully. Rich – thanks for taking the time to post back…I’m glad the formula was able to help! Thanks so much for taking the time to work though this clever formula. Jeff, your explanation really helped out a lot with the problem I am currently working on. However, I do have one question. If I wanted to find the string of SegmentB or SegmentC, how would you find it? Looking through your work, I was thinking having 2 delimiters would be the way to go, but I have not been able to figure it out. A few ideas come to mind. If you want to stick with a formula-based approach to grab the second segment, you can manually set the Occurrence argument of the SUBSTITUTE function to 2 and then grab the MID of the values between the first delimiter and the substituted marker. However, at that point the text-to-columns or Autofill feature may be an easier option. I think I recall seeing some posts online that provide a formula-based workbook that basically does text-to-columns, so if the data is updated frequently that may be worth exploring as well. Appu – I totally agree…or at least an argument that allows us to specify search in reverse! Another use for the formula is to isolate the file type/extension from the full text of a file name. I often get a Command prompt DIR /s listing of directory and file names and it is useful to separate out the file type. That is more complicated now as file extensions may not be just 3 characters, and dots can appear inside the filename text as well, so searching for the last ‘dot’ is a key to that problem too. Similar to the 1st question, but could this be achieved if there are multiple characters along the string? Is there an excel expression to parse by ‘/’ and retrieve ‘http://hostname/path/relative/to/image’? Yes, indeed. The general idea is to use the LEFT function to return the string to the left of the last delimiter (rather than the RIGHT function). It did help indeed Jeff!, many thanks for having a look… much appreciated! It basically says if you can’t find the delimiter then return an empty string “”. Wow, did this article save me in a pinch! Thank you so much for explaining this so well. I received a terrible spreadsheet from a client which included the street and city address in one column (almost 1,000 rows). There were many commas in some cells, so I had no idea how to tackle this until finding your post. Saved me hours! Great…glad it helps…thanks for the comment! Great formula, just what I was looking for to extract filenames from Windows “path” strings. I just replaced : with \ and Bob’s your uncle! Thanks very much, especially for the step-by-step explanation. Brilliant! And very well explained. Simplified my work – Thanks a ton! is not working for me. What could be reason? This was one heck of an article! Thanks so very much, Jeff! Fantastic article. I’ve been working w/Excel since the ’90s – and always love it when I learn something new! Great work and a real time saver! Thank you! Great explanation about why the formula works. Is there a similar formula that could return everything before the last occurrence of a character or delimiter. The above formula says how to return everything after the last character delimiter. Yes, no problem. So, the RIGHT function retrieves characters after the delimiter, but you can use the LEFT function to retrieve characters before the delimiter. Note that you’ll need to update the second argument to use the correct number of characters you want returned. Thank you…this saved me a ton of time (Parsing a couple of thousands of rows where I need the values after the 8th delimiter – I was building multiple columns, building on a mid/search of the prior string until I had the last column.